Waddell was a mainstay in the UVa rotation from the beginning of his freshman season, when he was their opening day starter. He made 50 starts over his three seasons without ever pitching in relief. He had a strong sophomore year, posting a 2.45 ERA in 114 innings and showing excellent control with 19 walks and 73 strikeouts. In his junior year, he ERA rose to 3.93 in 91 innings, as he walked 49 batters in 110 innings. A blister issue may have contributed to his up-and-down season. Waddell has a three-pitch mix, throwing his fastball 89-91 MPH, along with a curve or slider, depending on the source, and a changeup that are at least average. His upside may be as a fifth starter or possibly a middle reliever. Baseball America ranked him 343rd on their list of the top 500 draft prospects. Waddell didn’t sign until two days before the deadline. His bonus was slightly under the slot amount. The delay resulted from UVa’s title run in the College World Series, in which Waddell starred as the winning pitcher in the final game. As a result of signing late, Waddell didn’t make his debut until August 9. He pitched well in his first two starts, then struggled for three, including one in which he lasted only a third of an inning. He pitched well in his final start. The Pirates were cautious with him, letting him go beyond four innings only in his final game. Some of his struggles resulted from a high BABIP of .348. He had a large platoon split, with left-handed batters managing only a .409 OPS against him (in a very small sample size) and right-handed batters doing much better at .806. Waddell’s season got off to a great start. As they typically do with advanced college draftees, the Pirates jumped him up to Bradenton. He was so dominant there that his manager commented that he looked bored. After five starts, the Pirates promoted him to Altoona and it was a different story, as he couldn’t throw strikes. He wasn’t exactly wild, but he consistently missed the strike zone by just enough that hitters didn’t chase his pitches. Eventually he’d catch too much of the plate and he’d get hit. Even then, he didn’t get hit all that hard. At Altoona, opponents batted .271 against him and slugged .397. Those were above the league averages, but not terrible. He also remained a strong groundball pitcher. On the season, left-handed hitters had a .628 OPS against him, compared to .719 for right-handed hitters. He may or may not have made progress later in the year. His ERA was 4.88 in May and June, and 3.53 from July 1 onward. His walk rate actually increased, though, from 4.0 to 5.2. Thanks to a forearm strain, Waddell had trouble staying on the field. The problem arose after his first start, keeping him out until May. He returned for a month, but went out again, this time trying PRP injections. After rehabbing he returned to Altoona at the end of July and made seven mostly good starts. In April and May he was able to average less than four innings a start, but in those last seven he averaged five and a half. Waddell’s control was much better; in those last seven starts he walked 15 and fanned 35 in 38.1 IP. He had no platoon split. 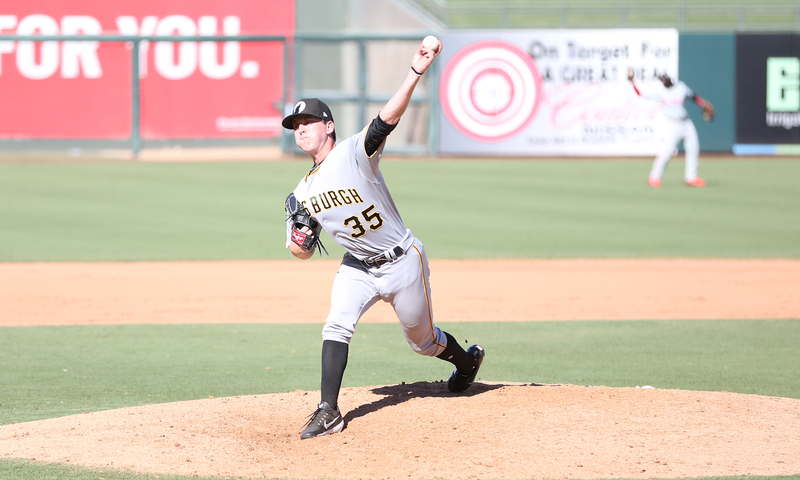 Waddell opened the season back at Altoona and pitched very well through nine games, eight of them starts. He did a better job of getting ahead of hitters, walking fewer and holding opponents to a .206 average. After a promotion to Indianapolis, he had a lot more trouble. The walks returned and opponents batted .285 against him. He at least kept the ball in the park, allowing only three home runs. On the entire season, he was much more effective against left-handed hitters, holding them to a .615 OPS. Right-handed opponents had a .732 OPS. Waddell is eligible for the Rule 5 draft, but wasn’t added to the roster. He’ll be back at Indianapolis in 2019. June 9, 2015: Drafted by the Pittsburgh Pirates in the 5th round, 157th overall pick; signed on July 16.